Polycarbonate and alucushion insulation installation. Custom made structure with wider doorways and crane rails. 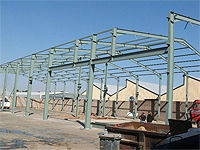 Standard portal frame structure - various sizes available. 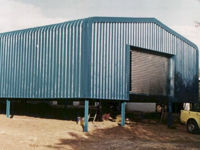 Enclosed structure with bullnose and roller shutter door – Chromadek. 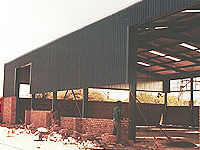 20m structure with bullnose cladding, windows and polycarbonate. Structures 2000 manufactures a range of affordable portal frame steel structures, designed by a civil engineer and fabricated with pride and precision. 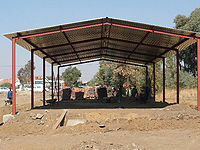 In addition to the standard range we can custom-manufacture structures according to requirements. 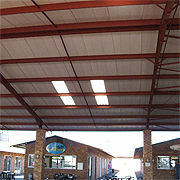 We erect our steel structures throughout South Africa, and we export to African countries and Indian Ocean Islands.